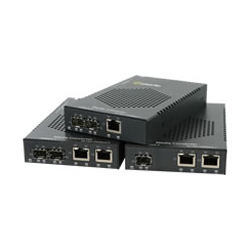 Perle Systems has released its IEEE 802.3bt compliant High Power PoE Fiber Media Converters. Driven by the demand to connect power hungry IoT devices, IEEE has introduced the 802.3bt standard, also called high power PoE (Hi-PoE), that can produce up to 100W of power at the PSE port while also increasing PoE signalling abilities for improved efficiency. This new standard supersedes all pre-standard proprietary solutions such as UPoE, 4PPoE, PoE++, UltraPoE and 4 Pair PoE. Also, it is completely backwards compatible with the existing IEEE 802.3af PoE and 802.3at PoE+ standards. The new S-1110HP Hi-PoE Media Converters are classified as PSEs. While using standard UTP cables that carry Ethernet data, Perle Hi-PoE Media Converters supply up to 100W power to PDs that support the 802.3bt standard. The devices feature single or dual 10/100/1000Base-T RJ45 ports to power one or two PDs, such as pan-tilt-zoom security cameras with heaters, LED lighting in building management, and 802.11ax/ac wireless access points.